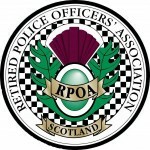 Glasgow Branch is one of five branches covering the Strathclyde Police Force area. The Branch was formed in 1947. At the start of the current membership year, May 2016, we had a listing of 709 members. The majority reside in and around the Glasgow area but there are members residing throughout the United Kingdom and indeed worldwide with addresses listed in Canada, America, The Canary Islands, Australia and Spain. The Committee meet four times a year and the membership have the opportunity of meeting annually at the Dinner in February and at the AGM in October. In September the Annual Report, renewal notice and News Letter are sent out to all members along with any other items of interest.